There is an epidemic facing our business world. The symptoms may go undetected and has spread like wildfire in a drought. This type of epidemic can be so destructive that it actually destroys businesses from at the very core and no one sees it coming, especially when its company-wide. This condition spreads through daily activities, mutual conversation and even electronically communications undetected. There is no way to spot once its too late to protect yourself or others. Okay, so it sounds like a commercial right. True, but in reality, it is a statement of support. When an organization creates ideas from interaction of co-workers, capturing these ideas so that they are documented as well as shared aids in the propagation of these ideas. 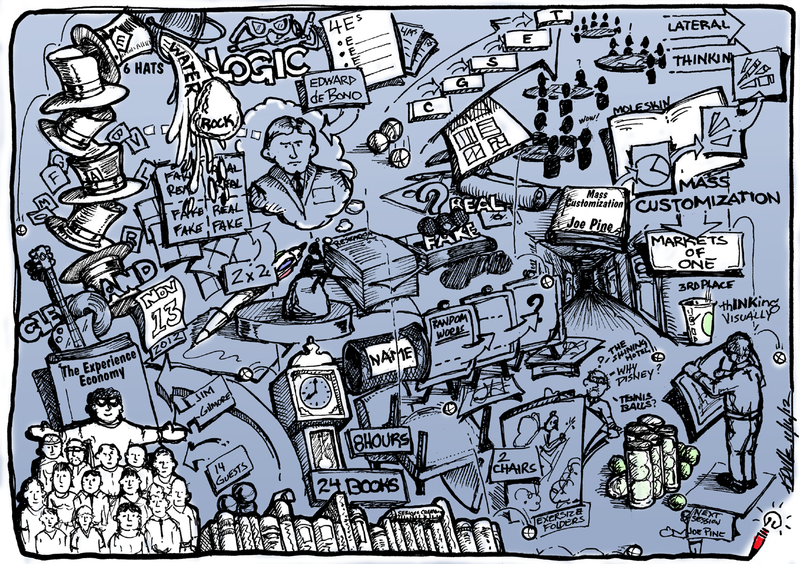 One of the most powerful tools is graphic recording, capturing ideas in both written and graphical documentation so that the information can be reflected upon and shared. Graphic recording does not always have to be done larger than life on huge sheets of paper on the walls, no, you can scale down to sketchbooks or even small notebooks. Whatever the size you choose to use, make sure you share. When you share ideas captured, you inoculate against the epidemic of forgetfulness, the killer of great ideas. 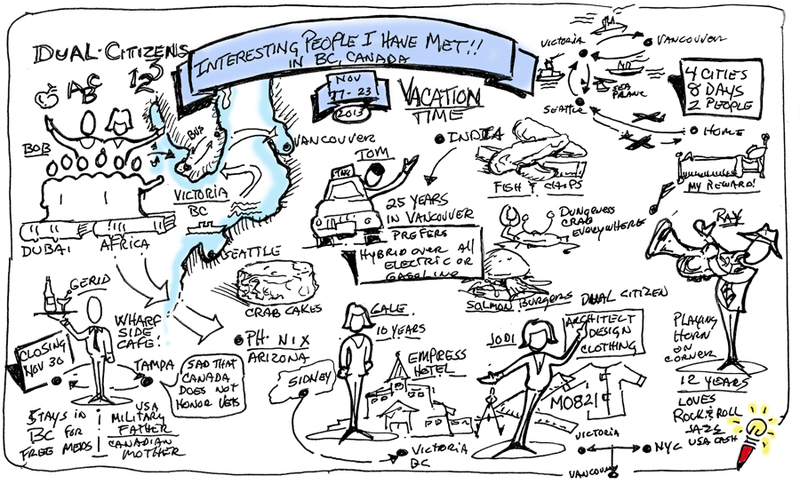 So to all those who meet, share, present, communicate, doodle on napkins, capture these ideas and document them to share. You never know who may see them and build on the idea to make them real. Always remember, make intangible ideas tangible so others may SEE! In sketchnotes, we share the idea of capturing emotion with smiley faces on stickmen and these are easy and classic, there is also a way to add emotion to words with a bit of forethought and practice. Let’s have a bit of visual fun and add stronger emphasis on those words we use. A great source for lettering with emphasis are comic books, children picture books and graffiti. Learn from others who communicate with strong visuals to enhance your visual notes. 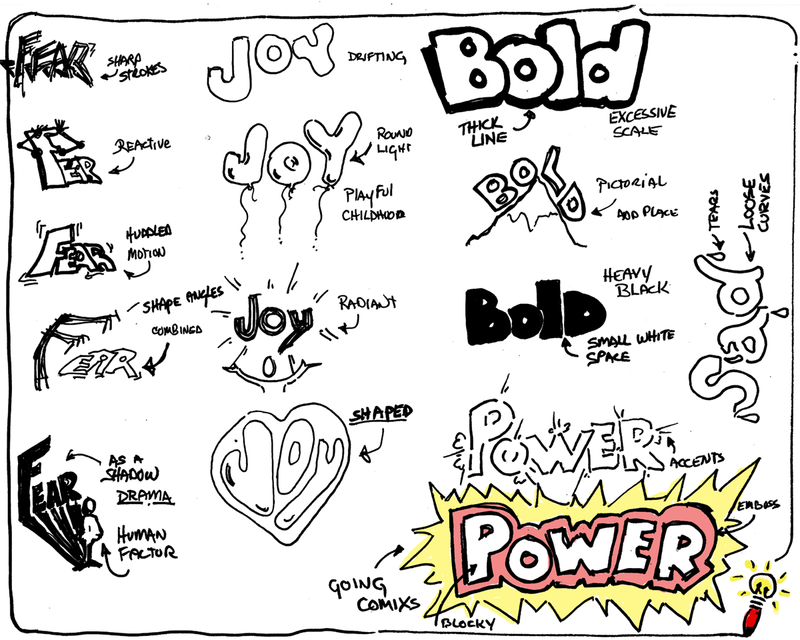 So, just as you build up your visual library, try building your word emotion library as well. The more you add visual clues to your Sketchnotes and Graphicnotes, the greater the impact of the underlining information. By the way, did you notice your eyes went right to the “POWER” word. Color also is a great add to emotion. Remember, keep your ideas sketchy and visual, because the best ideas are ones seen by all. Graphic recording, visual thinking and even sketchnoting are all things hard to communicate via email, phone conversations and even one-on-one, so how can you share what you do with impact and clarity? Find a captive audience and let the show begin! Recently, on a trip to Vancouver, BC, I was onboard the Clipper heading over to Victoria on Vancouver Island. Ferry crossings are slow and take a good amount of time. Like all public transportation, the seating is adequate. On the Clipper, seats are arranged in tight groups of four around mini tables that are provided for eating, reading or just relaxing. The advantage of traveling with one other person is that you always end up seating across from two strangers. On this trip as with so many others, I pulled out my sketchbook to record some ideas I have thought about. I opened up my pad, grabbed by pens and began visually reconstructing an idea. Immediately, the couple across from us became interested and then hooked. Their eyes followed as my hand moved from one node to the next as if unveiling chapters in a story. Eventually, one of my audience speaks up. “What is that you’re doing?” That’s my cue. Start the music from the Calliope, put on the smile and it’s showtime? My response is always the same… “I’m capturing ideas visually so others can understand later on.” This is vague enough to get a head nod or a tilt of interest. The next few minutes I explain how visually we all think and remember things as well as show examples of earlier work, either on my tablet or from the sketchbook. I share with them how others have used my talents to better communicate or identify ideas to larger groups. While all this is happening, curiosity spreads around the nearby seats and more eyes and ears are drawn in on the conversation. I demonstrate how it helps, not by using the spoken word, rather by starting a new page and banner title it “Interesting People I Have Met”. I ask them to share why they do what they do and begin the recording. I ask eavesdroppers also. Soon a handful of people join in and the fun begins. People begin connecting with me and with each other. Eventually, someone inquires about applications of this thing you do. Time to get contact information and spread out the calling cards. Remember, you’re not just creating new friends, this is you livelihood and the best way to promote yourself, because you never know if they may be the next client or stepping stone to that client. At this point I always politely try to get email addresses to send them links to see the final work as well as my portfolio. Anywhere there are a mix of people waiting for something, you have an audience to entertain, share stories and eventual educate to the world of graphic recording and visual thINKing. I am not usually one for creating How-To-Dos, but I created this to help other sketchnote enthusiast develop their skills by explaining some of the techniques I use to develop quick sketchnotes. 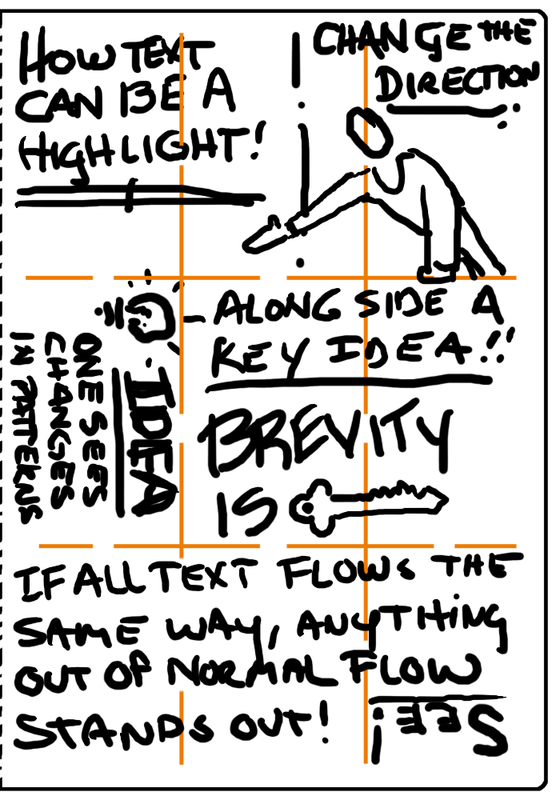 When starting a sketchnote, keep in mind it’s about brevity of content and not dictation or transcription. 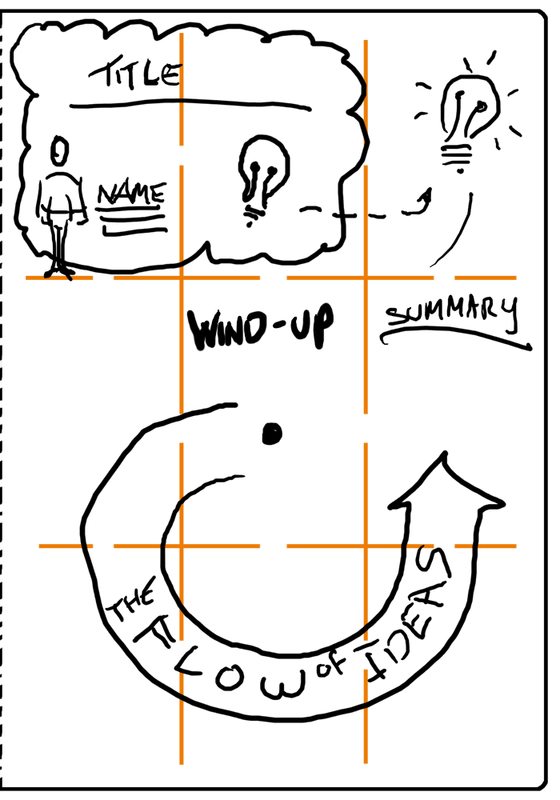 Sketchnotes are more about getting the sense of the conversation or communication than it is gathering details and full sentences down on a page. On that word “Page”, let’s take a look at the typical page and I’ll show you some ways on how to layout out your sketchnotes before your recording begins. First, let’s look at the common Moleskine or sketchbook layout in portrait mode. For those not familiar with this term it means when a page is in the tall mode as compared to landscape which means its in a wide mode. Okay, back in portrait mode. To make it easier when recording and controlling placement, I imagine my page like a Tic-tac-toe game. 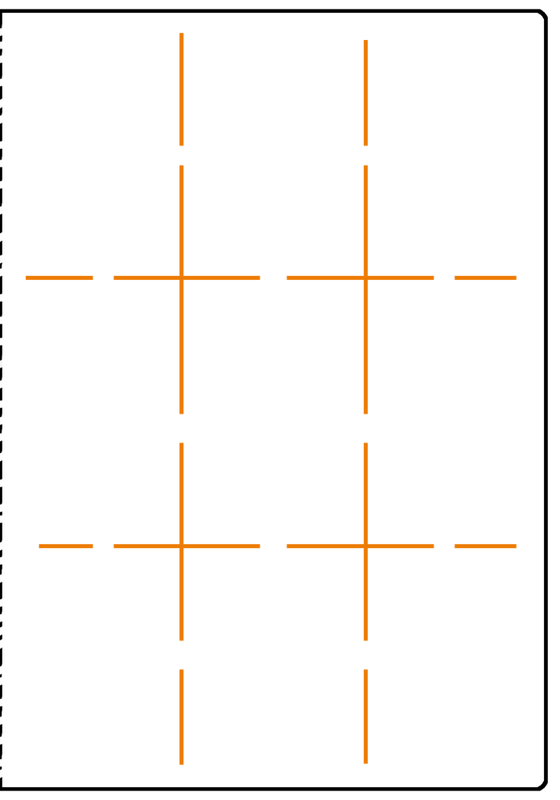 I divide the page up with three columns and three rows as illustrated in image 01. 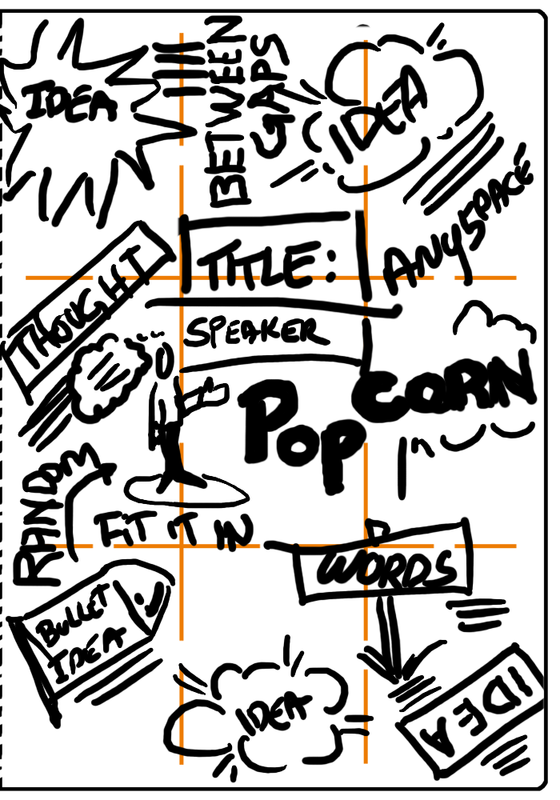 For speakers or presentations, this nine box layout works nicely. Over the years I observed that good presenters who present consistently normally keep their presentation to three to five key topics with a good summary. 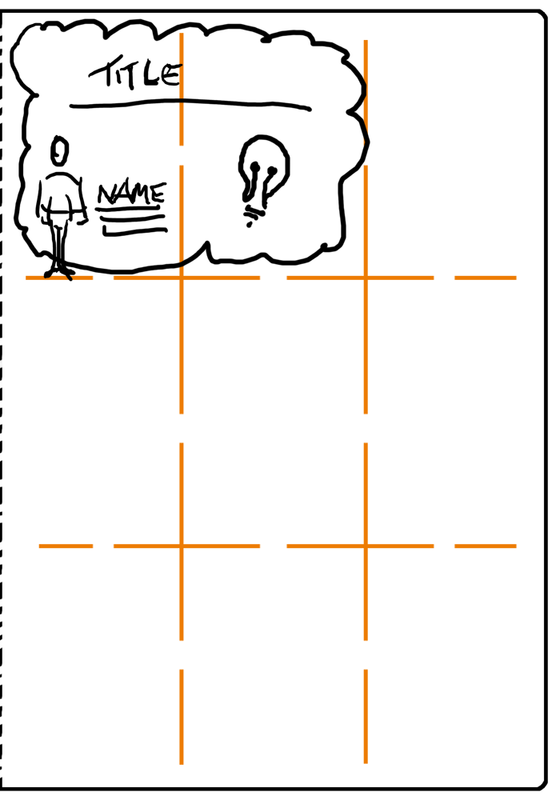 The grid allows you to use each small space as an area for each topic or key point. In the next illustration (Illustration 02) I choose the upper left hand space and the upper center space for the Title and speakers name plus the date and time of the event. Some other sketchnoters will also include at which event the sketchnote was made. Let’s talk about flow and I don’t mean the waitress at the diner or that funny woman who sells insurance on TV. 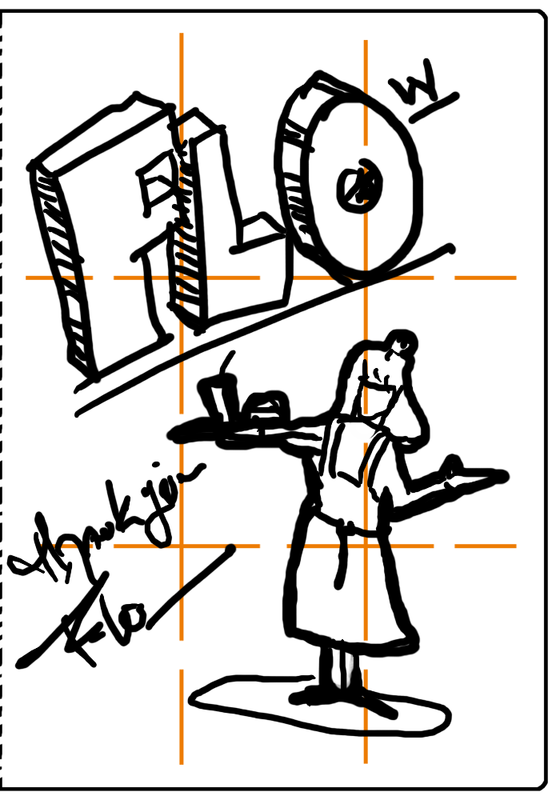 Flow or directionality is very important when you or someone else reviews your sketchnotes later on. It is important to determine how your content will flow along on the page. I find it best when starting out to pick a flow style and practice in that framework until you get comfortable with organizing content on the fly. The first flow pattern is what I like to call “NewsPaper”. It is similar to what it represents. Like a traditional Newspaper layout, the content flows down columns as seen in the illustration below labelled “Illustration 04”. Starting from the left hand side just beneath the title block, content moves down each column and over to the right. The advantage of this flow pattern is that most readers already have been familiarized with this pattern subconsciously and follow along quickly. I like this pattern for another reason. 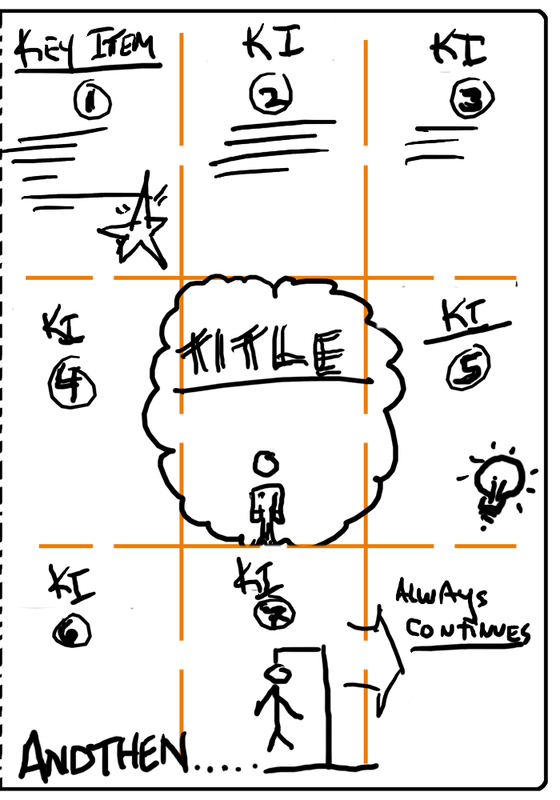 This pattern uses a controlled directionality forcing the summary or highlights of the sketchnote to end in the opposite corner of the title block, anchoring the page. The next pattern I call “Book Read”. Like the Newspaper, Book Read follows a historic pattern of content moving from left to right, top to bottom. Unlike Newspaper, this pattern is a single column as you would find in any literature publication. Because it is a traditional flow, readers can follow very quickly the content. This is also a good application if a presenter uses many quotes that may be relevant information. Also, quotes can be used as dividers within the content. This next pattern (Illustration 07) limits the creative flow of the sketchnoter. This pattern I spitefully call “Andthen”. I call it this, not because of any pattern or flow issues, rather because of 3 presentations I was unfortunately required to record. In each of these presentations, the speaker did not transition well between key ideas nor was there any connectivity of most of the ideas expressed, except for the speaker’s choice of connecting phrase “and then…” My hopes are that you never need to use this nor experience a presentation like this, but you will… some day… and then… you’ll get the pun. Final pattern as shown in illustration 08, is what I like to call “Popcorn.” As the name implies, content is located around the page almost randomly. Strangely, this actually works well during brainstorming sessions where participants share key ideas and little supporting information. 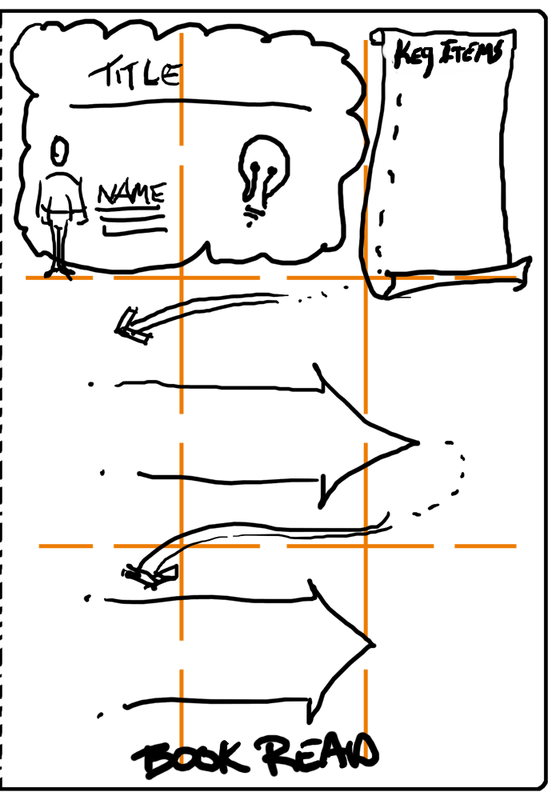 this form of sketchnotes is a very high level recording process. 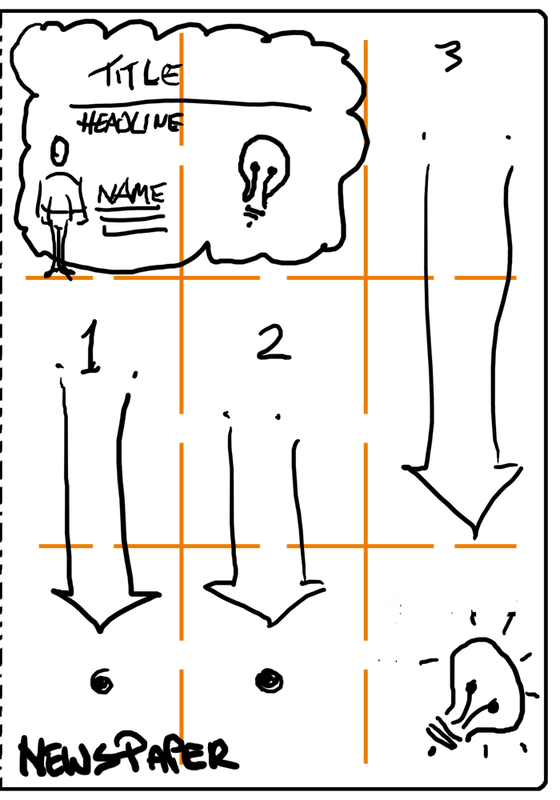 (See example) By placing ideas at various, unconnected locations on the page, each idea stands on its own merit or premise. By adding cloud shapes, boxes or other graphic elements, the share the space, yet are still individual thoughts. Another addition to this is slightly shifting the angle of the text to add a visual separation in the ideas and re-enforcing its uniqueness within the group of other ideas. Speaking of directionality, let me show you another quick trick to add emphasis to your content by shifting the direction of your text and icons. Look to illustration 09 and see which text jumps out at you. Two of them should have caught your attention; “Ideas, One sees change in patterns” to the left of the large word “BREVITY” and to the bottom right hand corner the word “See!” Why did these catch your eye? The simple reason is that they did not follow the pattern of text like the majority of the page. They disrupted the flow, thus drawing your attention to them. This is a tactic used by many advertisers to draw your attention to an object or a key word or phrase, Even the arm of the figure catches your attention since it slant down at an angle opposing the direction of the rest of the text. This is a very powerful tool when done right. Over use this trick and your page begins looking like the “Popcorn” page. I use this method when I want to emphasize a key idea or an opposing idea of the group that creates discomfort. Think of it as the 800 pound gorilla of text. You can not but help see it if everything else lines up properly. 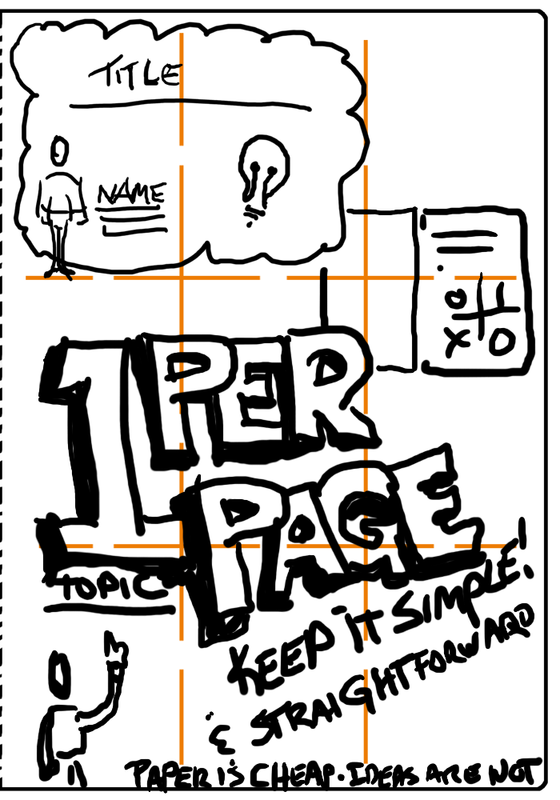 First words of advice, try to keep your sketchnotes topics one per page. 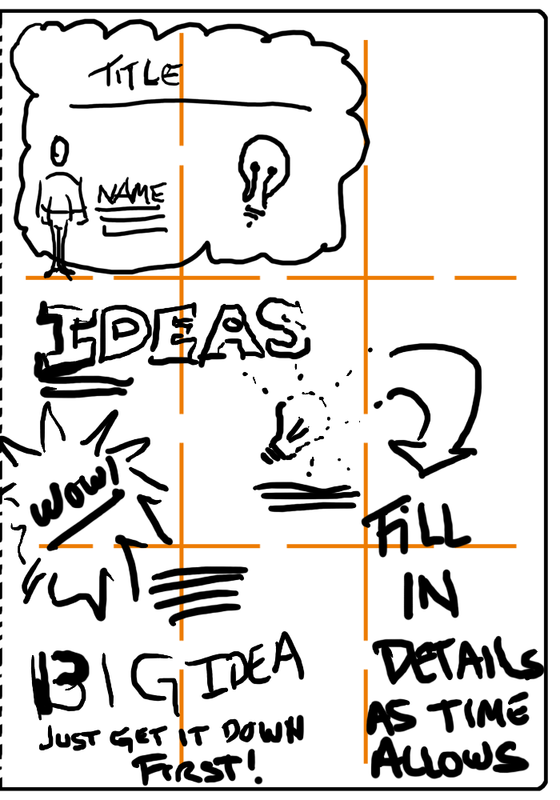 By doing this you can organize your sketchnotes easily and efficiently. If you use a digital sketchnote or scan your sketchnotes and store them digitally, you can tag each sketchnote with key information that makes retrieval easier for you and your readers if you share them on a blog or gallery. A great example of this is visit Sacha Chua’s gallery blog and search content to your heart’s content. She is an amazing organizer of data. Second, fill in details later. Get the most important things down first, you can always come back later and fill the text to make it bolder or add dividers and icons to help improve retention. Don’t feel like you must have each image or text completed before moving on. In many cases, conversation as well as presentations, have filler conversation which will give you time to go back and add details or supporting images. 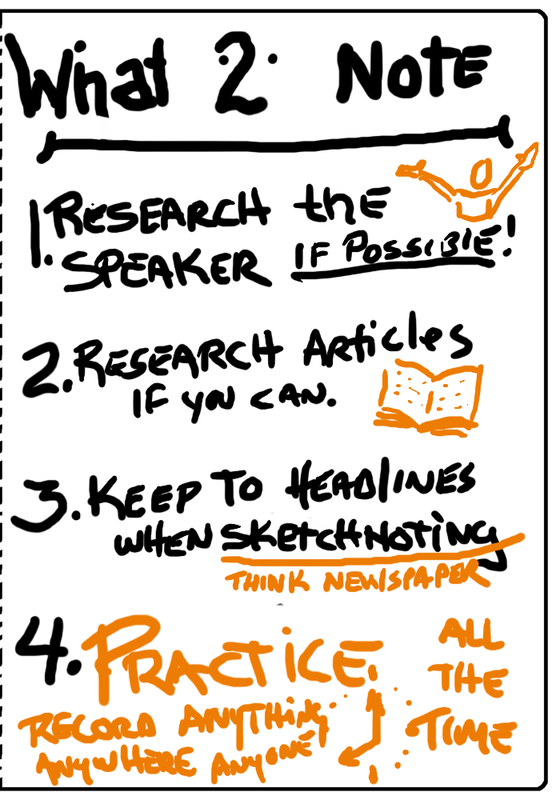 Last words, my four rules sketchnotes and graphic recording. One; know before you go or in this case, if you’re going to be sketchnoting a presenter like those at TED or other industry events, research before you sketchnote. Find out about the person you’re going to be recording if possible. With YouTube, Vimeo and the like, you can experience the style of the presenter and be ready to know how much detail is going to be recorded. Two; Research some of the content to get a feel for the language the presenter may use or is related to the topic or industry they speak from. Knowing the language will help your keep your sketchnotes filled with headline type copy and avoid transcribing the conversation. Three; Keep your text to headlines. Avoid being a transcriptionist and be brief and bold. Fourth and last; Practice. As the old adage goes… “How do you get to Carnegie Hall?” ask the passenger to the taxi driver. “Practice, practice, practice.” the driver replied. 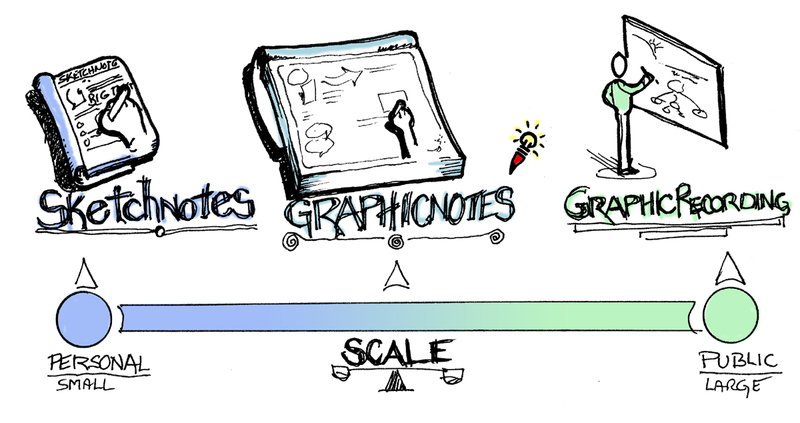 SO practice with anyone, anywhere and at anytime you’re free to sketchnote. Just practice. By doing this you build your library of icons and hone your page style as well as page usage. To learn more about sketchnotes read Mike Rohde’s book “Sketchnote Handbok” a great guide to the methods and strategy of sketchnoting. I hope this helps and keep those notes sketchy and flowing.